Pace students Fanie Liu and Robert Fairchild set out for their assigned area, the city block bordered by Elizabeth, Hester, Mott and Grand Sts. last week. "When people see us doing things they don't get too angry and don't really bother us because they see we're looking at the sidewalk and the roadways and not paying too much attention to their establishment," Fairchild said. The student volunteers - brought together by the Chinatown Partnership Local Development Corporation, a newly-formed business group - are trained to observe an issue like a cracked sidewalk and walk several steps away before recording it. This is done so local businesses won't think they're being issued a violation by a government agency. Each of the ten student teams was issued a map, a list of several hundred problems to look out for and a personal digital assistant (P.D.A.) with a built-in camera and special software to identify and log any of 330 various quality-of-life issues. "People judge the way a city is by what they find on the streets," said Barbara Cohn Berman of the Fund for the City of New York, a non-profit that designed the mapping software. As the student team approached their assigned block, Berman walked under a scaffold with no visible permit and stepped around a fire hydrant surrounded by cracked pavement. "We have a lot of issues here," she noted dryly. At the corner of Elizabeth and Grand, Liu observed faded crosswalk lines and logged them into the P.D.A. An open cellar door with no pedestrian gate invited a fall, and was duly noted. Street cracks were recorded as a trip hazard, and several doorways of graffiti were logged. Standing water had gathered in a street depression, emitting a rank smell. "We can't capture the odors, but there are odors," sniffed Berman. A bike chained to a traffic sign could be gone in an hour, so why was it logged in the database? "The Chinatown Partnership asked us to identify issues, maybe to inspire bike racks," Berman said. Old stickers and flyers defacing a lamppost could lead to community bulletin boards. "So, there are opportunities that arise from problems." Walking north on Mott St. brought a new host of issues; broken bricks in a tree pit, a roadway rutted along the curbline, an unlevel manhole cover creating a puddle and odor. A lamp pole base was missing its pole, resulting in a notation of "incomplete installation." It was an unusual issue, so Liu paused to take a picture. The photos will be used later to help agencies identify problems and their exact locations. More uneven pavement filled the block. "Our test," Berman explained, "is to put your toe over it. If it gets caught, it's a trip hazard." She slid her sneaker over the crack. It got caught and was logged. Ninety minutes of reconnoitering around the block had produced 36 issues. Berman will take the P.D.A. and upload the data, print out a spreadsheet and bring it to the next class for discussion. 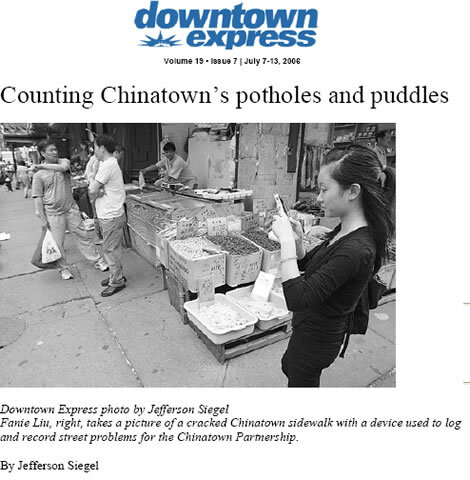 "I think it's good if it helps out Chinatown," Liu said as she finished entering data. "I do look at the streets differently," Fairchild said as he prepared to walk to Little Italy for pizza. "It opened up my eyes to the numerous problems on the city streets. I think coming out here and taking note of all the problems will help the community, the local people that live here and the tourists that come around," he said. The Chinatown Partnership is financed by the Lower Manhattan Development Corporation and the September 11th Fund. "The [mapping] program is part of the benchmarking of existing conditions in the community," said Wellington Chen, the Partnership's executive director. "The condition of the roadway, potholes, missing electrical plates, graffiti, sanitary conditions," he observed, are all factors that can make or break a neighborhood. His group wants to make it easy to identify and fix all those problems. "There seems to be a correlation," Chen believes, "between quality-of-life issues and a judgment on the performance of the community and the government." The group investigated and found there are at least 17 different city agencies that are responsible for street issues. They needed to create a shortcut around all that red tape. "With the magic of new technology, we created a program which includes all the many street features and their associated problems," the Fund's Berman said. "Our real aim is to create data that both the community and government can trust." The program works like the New York Police Department's CompStat system, which uses computer programming to pinpoint areas of crime. The Fund's program now being used in Chinatown is called Computerized Neighborhood Environment Tracking, or ComNET. It allows surveyors to log problems as varied as puddles caused by roadway depressions, to graffiti, to flyers posted on lampposts to broken parking meters. The surveyors for the Chinatown project are students from Pace's Lubin School of Business. "Part of their work has been to research Chinatowns throughout the world," said Claudia Green, director of Pace's Hospitality and Tourism Management program, which is near Manhattan's Chinatown. Many businesses are cooperating in the program, Green noted, since the results are intended to benefit them. Another goal is to develop a map of Chinatown that would show where the Malaysian, Vietnamese and other ethnic restaurants are, since the area is associated primarily with Chinese dining. Helping guide the database through the maze of city agencies is a 32-year veteran of the Department of Sanitation, Al Rimer. Recently retired from New York's Strongest as a borough chief, Rimer is now the Partnership's director of operations for Clean Streets. "Graffiti removal, power-washing sidewalks, sweeping sidewalks, sweeping the gutters, whatever's in the streets," Rimer lists as objectives. Painting light poles and mailboxes as well as specialized cleaning is scheduled to start in August. "There's a lot of issues in the streets, from paving to broken sidewalks to ponding of water, graffiti, stickers."